Work has started again! 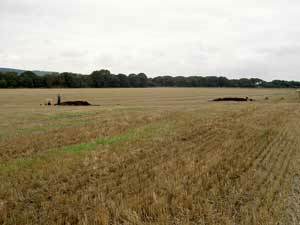 Since 2003 Archaeologists have been excavating in what is the most well known of all Mesolithic sites: Star Carr. A major archaeological joint venture between the Universities of York, Manchester, UCL and Cambridge generously funded by the British Academy, The McDonald Institute in Cambridge and the Vale of Pickering Research Trust, is devoted to revealing new secrets about this intriguing site and to excavate the abundant remains before they are destroyed by further field-drainage. 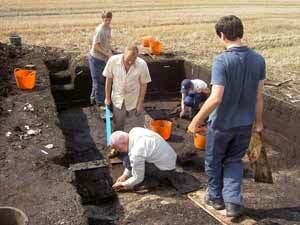 The site was first excavated in 1949-1952 by Grahame Clark of Cambridge University. It is famous for its rich assemblage of artefacts items including rare pieces such as antler headdresses, barbed points and shale beads. 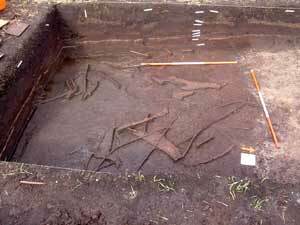 In the 1980s a trench and smaller testpits were opened to the east of Clark's excavations. A dense spread of lithic and faunal material associated with a timber platform was encountered suggesting that Star Carr extended considerably beyond Clark's original delimitation of its boundaries.